Home / Astronomy / Latest Technology News / NASA / Science / A Go Pro camera was launched into Space, here is what it filmed! A Go Pro camera was launched into Space, here is what it filmed! 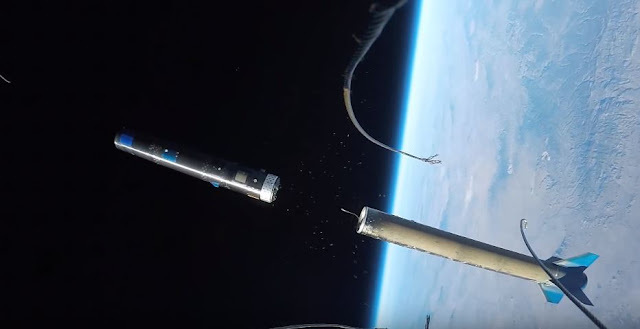 This footage from a Go Pro Camera attached to a rocket launched into space is incredible! The footage was filmed using a Go Pro Hero 4 camera attached to an SL-10 rocket which reached an altitude of 396,000ft (120,700 meters) and speeds up to Mach 5.5 (3800mph or 6115km/h) at engine burnout. There are several videos from space that show us how beautiful our planet is. Most of them are from NASA or other space agencies around the globe, but this video footage was filmed in 2015 when a 6 meter-tall SL-10 rocket was launched into space with a Go-Pro Camera attached to it.On November 6th, 2015 UP Aerospace Inc. launched the 20-foot (6-meter) tall SL-10 rocket into near-space. The mission: deploy the Maraia Capsule testing the aerodynamics and stability of the payload on re-entry to the atmosphere. The rocket reached an altitude of 396,000ft (120,700 meters) and speeds up to Mach 5.5 (3800mph or 6115km/h) at engine burnout.